The inspiration to tell a firehouse story is coming from the best writer of this site (Johnny Gage). Never too late to start a new career Johnny - I think you could come up with a best seller. Anyway, E37/L40 (125 St./Harlem) has always been a squared away house, though senior man laden L40 sorta ruled the roost. Back in the early 80s, a newly promoted "slashing Capt." from the Bronx was covering a vacation spot in L40. Cap is up in his office doing some paperwork, door opens and in comes one of the junior men in 40, looking to put in a mutual (swap a tour with another FF), the Cap looks at him and says "what do you need"? The guy tells the Cap that he is going to put in a mx. The Cap says "no problem, but first go back out and knock on the door before you come into my office". The guy says "ok Cap" and goes back out, but doesn't knock on the door, instead he goes down to the kitchen and tells his story to the men prepping the meal. One of the senior men in 40 tells him "don't worry about it, the Cap is working straight tours, you're working tomorrow, when he goes home in the morning go back up to the office and put in your mx". The following night the Cap comes in and stops in the kitchen for a cup of coffee, the same junior man is going home after his 24 and says hello to the Cap, before heading out the door. Shortly after the night tour begins, the senior man working in 40 goes up to the office, walks in and tells Cap he needs to put in a mx. Cap: "no problem, but first go back out and knock on the door before you come into my office". Senior man: "ok Cap" and he goes out of the office. Senior man: "there's a small problem Cap". Senior man: "there's no door to knock on"
The Cap went to look at where the now missing door had been, then asked the senior man "where is my office door"? Senior man told him that the office never had a door as long as he had been in 37/40. Cap shook his head. A few more tours and his vacation coverage in L40 was finished. No sooner had he walked out onto 125 St. and the L40 office door was once again in place. The Cap never did cover in 37/40 again! In the spring/summer of 1992 I was detailed from L 112 to the rock to become a Ladder Company Chauffeur. Two weeks of training I was ready to drive the big red machine! I was not the regular 112 Chauffeur, strictly back up. But I drove often. 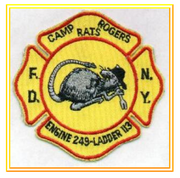 Today I would be detailed to Ladder 113 in Crown Heights, “Camp Rogers Rats”. I was excited to go. I liked 113, they were a gritty firehouse, outstanding fire fighting company, good fire duty, and much like our joint, they were known for their pranks and antics. Walking into the firehouse I was greeted warmly. The ladder chauffeur going off duty showed me the rig. It was very similar to 112, piece of cake. I give the rig a good wipe down. I head to the kitchen, before I get my coffee I notice the pull handles have been reversed on the refrigerator, so that if you pull on the handle side that side of the “hinged” door does not open...very clever I say to myself...I poured myself a black coffee, and headed to the sitting room off to the side of the kitchen with the daily paper. In The sitting room was a large wooden cut out of a Ladder 113 maltese cross mounted on the wall with a rat in the middle. The rats red eyes would illuminate to the pulse of the computer when a run came in, I thought that was very cool. We had a few runs, nothing significant. At 1300 hours the call goes out; “Chows On” . I proceed to the kitchen...most of the guys are sitting down...yes, with a brown plastic dog bowl in front of them. They are not directly looking at me, but I am clearly the focus of their gaze out of the corner of their eyes. They are waiting for my reaction. With not a twitch of facial expression I grab my “dog bowl”, it is a penne pasta dish of some sort, and it actually looks good...I proceed to the middle of the table where there is an open spot and sit down. Nonchalantly I take my hand, and as you would scoop up a handful of M&Ms in a bowl, scoop up the penne bare handed and feed it into my mouth, like I have done this a hundred times before. You could see the disappointment in some of their faces as they went back to their meal, however, I did over- hear one brother on the end say to the other; “effen 112 guy”. Now, what did he mean by that? Well, stay tuned, I will give you a little background of a classic meal in 112 next in MEALS, Part 3: “Something’s in the air”. I remember it well, summer of 1992. It was the usual hot sticky night in Bushwick. Walking across the street from the parking lot where we parked our cars in a secured lot toward the firehouse, you could smell the rotting garbage from empty lots that permeated the thick air. I checked into the housewatch, looked at the incoming riding list and was delighted, all great guys and officers working tonight. I had the feeling the stars were aligning we were going to have a special night tour! The night tour started as expected, the usual runs, abandoned derelict car fire here and there, food on the stove mixed with a few 92’s. We were working up an appetite, the Engine had the meal and served it promptly at 2100 hours...Normalcy ended at 2101 hours. As I’ve explained before in another thread, the Knickerbocker Avenue quarters was designed for a single engine company, Engine 277. Ladder 112 was temporarily relocated to 277 until a new quarters for them was constructed. This was a few years ago. (Currently E 277 and L 112 share a state of the art new firehouse). This was way before the new quarters was built. The temporary relocation became permanent. The apparatus was positioned front to back with with a single bay apparatus door. Simply put, you had two companies living upon each other. Bathrooms were few, one portable shower was installed, rooms were way to small, locker room congested, the bunkroom tight. The kitchen was a typical galley type kitchen you would find in a small home and the dining room was probably 15 x 15 feet... attached to a small sitting room that could just about hold two couches one in front of the other in front of a wall mounted TV. In the dining room, there was two tables. One in front of the other. Engine guys on one table, truck guys on the other. Two guys would sit in the middle against the outside walls of the room, someone on the ends , four would sit squished inside between the two tables. Seating for 12. I don’t know what started it, maybe it was a flick of a string bean, maybe it was a toss of a bun that had a little ummph on it. But it started. A little more tossing of food from one table to the other. Guys were beginning to position themselves... for they knew what was unfolding and close at hand. Incoming artillery was striking guys on both sides. It got heated. The engine lieutenant who was sitting in the middle row trying to eat in peace and ignore the surrounding shenanigans was abruptly struck directly in the back of his bald head with a handful of mash potatoes with gravy. This usually very calm and collected boss became unglued in a flash. He jumped to his feet, and without directly looking at anyone demanded an immediate cease fire. Both sides shut down giggling and kindly went back to eating. We continued to “eyeball” each other as we ate. I was sitting next to my truck buddy, Ira. Ira was the recipient of the first barrage of food from the other table, the engine table, namely Joey who fired the first round. Timing could not have been better. The department phone mounted on the dining room wall above Joey’s head rang...Joey stood up on first ring to answer “Engine 277 …..”, Ira took a handful of the jelly cranberry sauce, and pitching from the stretch he threw a devastating direct blow to the right side of Joey's head not eight feet away with such accuracy and force it sounded like spackle being slammed and splattered against a marble wall. The results were uglier than “Custer's last stand!”. Poor Joey, he never saw it coming. Cranberry was everywhere. The telephone mouthpiece had to be taken apart to clean out the sauce that was driven into the holes. Of course, the kitchen and dining room was washed down and returned to good order. The engine boss, never said a word and headed upstairs. Many outstanding fire officers and firefighters would call 277/112 home for their careers. I was very fortunate to work alongside these members. The fire duty and closeness of the firehouse made our bond between each other that much stronger. The camaraderie and razzing was unparalleled to any other firehouse I ever worked in. For a while the firehouse was called “The Ant Farm” for good reason. That night we caught a kick a$$ first floor job first due off of Central Avenue towards Engine 252. Joey had the nob, like the solid firefighting machine he and the members of E 277 they moved in and knocked the fire down, as we went about our assigned tasks. Another night in Bushwick. Something was in the air...cranberry sauce! Going back to reply # 18 above ...i spent several tours Covering with the "Rats" always good ....i remember back then they had a painting on the wall that was a searchlight shining above a city skyline...it was a takeoff on the Batman / Gotham City thing however instead of the Searchlight projecting the Bat Signal showing a Bat over the City it projected the Rat Signal showing a Rat over the City. Ira T. ... A good friend. We buffed jobs together before getting sworn in on 7/11/81 by Mayor Edward I. Koch. I know Ira T worked in 103, then became an MPO in 290. Ira T from POSA, you met him, you never forgot him, great energetic personality...From what I understand, there was only two Ira's on the job. Both Ira T. I got to work with both of them in 112 on same night tour when Ira from 103 was detailed to Knickerbocker Av. Both outstanding, great guys! The previous two stories are comical. In my career, I was lucky to be assigned to L 112. We had a great area to cover, we responded to areas where there was only single engine coverage. Being located on Knickerbocker Avenue gave us a huge advantage of a quick response. The area really had no "Projects" to speak of, which I was glad about. Our coverage was pretty much row frame and Brownstones. Fires in RF and Brownstones are "quick and furious". You have to be aggressive and get ahead of them quickly. Both structures had what we called "the dead man's" room. It was a room, usually over the front door that only had one exit out of the building. In a fire, the occupant of that room could easily be trapped. Frames were designed to be supported on either side. You had to be "heads up" if a frame was unsupported on either side for fear of early collapse. Like I mentioned, the RF and Brownstone fire could be fast and furious. Early and quick line deployment (get first line into operation was paramount) knocked these fires out quickly when only room and contents and be back in service for the next one in a couple of hours...BUT, If the fire got into the common cockloft of the frames you would be there all day at a multiple alarm. It would not be uncommon to catch one or two jobs during a 24 in our area. Sometimes we did "the hat trick" with three jobs. (My definition of a job; when you turn the corner you don't need to look for the address). One night we did the "hat trick" on one box: we turned out for a top floor job on Knickerbocker Ave, about 3 blocks south of the firehouse. It was a good a$$ kicker, three windows showing fire, but we knocked it out pretty quick. The chief told us to go back to quarters for relief and a change of clothes. The LCC instead put us 10-8 "available". Then what followed, "Brooklyn to L 112, getting numerous calls for a Bodega on Wilson". Yep, all hands job. We were exhausted, told the LCC stay away from the radio and started up Putnam towards the firehouse. It is now early morning. A block from quarters residents are running in the street yelling to us to stop, there is a fire in the building. Sure enough, room and contents in the rear top floor of a frame. Ira T. also worked in L132 for awhile after E232, Ira was the original "Tin Man" in the Tin Man outfit. Back in the late 70s into the 80s, the houses that comprised the 16th battalion back then (69/28, 80/23, 37/40), all pretty much had the same meal policy - you were either in on all meals or out of all of 'em, no jumping in if it was a meal you liked or out when you didn't care for what was being served. The 3 houses all had a policy of not charging guys from the 16th for the meal if detailed or working OT. You were always glad if you were detailed or worked OT in 37/40 because their meals were sumptuous, and EXPENSIVE, but yours was a freebie. There was a guy (FF P.A.) who was out on the meals, never a popular thing, but even more so in 37/40. In the early 80s, the 5th Division, in quarters with 80/23, was looking for a volunteer for a long term detail as a division aide - who should step up but FF P.A. Even though we already knew he was out of the meals on 125 St., we still got obligatory phone call telling us that he is outta the meals. Back then, the 5th Division aides would relieve each other at 4pm for the 6x9 tour. The new aide quickly developed his routine, come in at 4pm, relieve his mx partner, make his way to the kitchen for a coffee. Now in most firehouses, the kitchen is fairly quiet around 4pm and P.A. started to alter his routine a bit. He was seen looking in the fridge and on the stove, presumedly looking for lunch leftovers. Now 80/23 had a courtyard between the apparatus floor and the kitchen, with 1 window looking into the kitchen. One day P.A. was spotted helping himself to some leftovers, luckily the guy who saw this, said nothing to him , but certainly passed the info onto the guys. Net time P.A. was due in for a 6x9 tour, the guys buying lunch made spaghetti and chicken parm, but also bought 2 jars of alpo dog food, and not for McDuff the firehouse dog. After lunch, everything's cleaned up and put away - a pot of leftover spaghetti was still on the stove. The alpo was also heated up and mixed in with some leftover red sauce thus becoming a delicious looking, but foul smelling "meat" sauce. Not long after P.A. arrived at 139 St., he was in the kitchen, day tour guys made sure that nobody was in there. It wasn't but a couple of minutes and P.A. had a small bowl of the spaghetti and "meat" sauce heating up in the microwave, there must of been 6/7 guys all trying to look through that courtyard kitchen window. When he took the 1st mouthful, to this day, I don't know how he didn't hear the laughter from the courtyard. Damn, if he didn't scarf down that bowl full of spaghetti and alpo in record time. Couple of the guys walk into the kitchen with McDuff's food bowl and start fiddling with what's left of the "meat" sauce, talking about how they cooked up an alpo "meat" sauce as a nice treat for McDuff - the look on the aide's face was priceless! For the remainder of his detail as an aide, whenever he walked into the kitchen, there were always a few barks from the guys - he was Italian and had a sorta long surname and Alpo replaced the first 4 letters of his name - he became known as P. Alpo......o. Pretty sure he was glad when his detail was over. ^^^^^Good stuff 8060! You can't make this up. It was genius of the brothers to send a simple message...We also called those who were out and trolled around the refrigerator "seagulls"...one brother used to be "out" and eat all the commissary peanut butter with a spoon. Like you said, you are either "in" or "out" of the meal. When I cooked in Brooklyn I'd ask; in or out. If he said "what are you having" I'd say, "I'll take that as an OUT".